With the new calendar year upon us, there is no better time to look at doing an annual plan for yourself and your horses. The adage “If you fail to plan, you plan to fail” may not be directly true, it could certainly be re-written to “if you want to succeed, you need to know what success is and how to get there.” So, what exactly is involved in an annual plan anyway? I believe the most important part to start is to plan and define what your main goals are for the year. If you have not worked with goal setting before, there are some excellent articles online on goal setting such as this one by Michael Hyatt and this one on SMART Goals. To get started, you can always close your eyes and allow yourself to dream of what a great year looks like for you. Once you have finished riding Valegro or Big Star or the likes, repeat the same exercise again, this time thinking about what that year would look like for you and your own horse(s). Take these goals and run them by a coach you trust, working together to shape that vision into something ambitious but achievable, and then break that goal into the smaller, SMART goals you will need to let the big goal happen. Looking at the goals you have listed, what will you need to support you in this journey? How much coaching will you as a rider need? Would your path be accelerated or secured by getting a more experienced rider to do some training sessions on your horse? When do you need to do either of these sessions to make sure you are ready for the events you wish to attend through the year? Next, you need to work out what milestones you are hoping to meet during the year. Which major competitions are you hoping to attend and which big training sessions or clinics are marked in your diary or wish list? Note those dates, as well as cut off points for qualifications, entries and other requirements. Plan to start getting those qualification points early, and plan for a few extra events well in advance of the cut-offs, as things rarely go perfectly to plan. After that it is time to look at the maintenance and care for your horse. Vaccination due dates, dentistry requirements, farriery schedule, body work and any other schedulable requirements. You will want to forecast this for the whole year, and then look to for conflicts, as you will want to make sure you are not doing vaccinations or shoeing directly before a competition, and that you have any performance improving body work done in an optimal timing for the events that matter. Ideally, you will also make the same kind of schedule check for yourself as well, as there are two athletes in the equation. Lastly, you need to block in assessment and goal tracking sessions at least monthly, to make sure you stay on track or find the track again. Should you suffer a setback, this also offers a good opportunity to reevaluate, add steps to your plan, or to get ready to rock plan B. Remember, an experienced coach can be a great ally, and an invaluable part of your team both in helping you to plan and helping you to achieve. 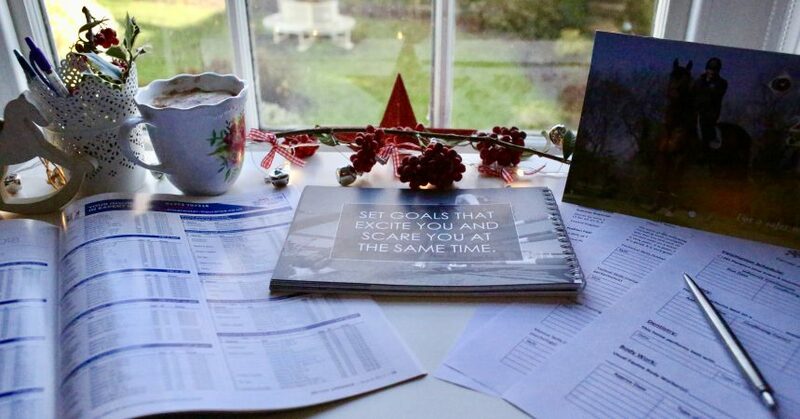 Have you done an annual plan, and if not, are you inspired to make one now? Either way, I’d love to hear from you.